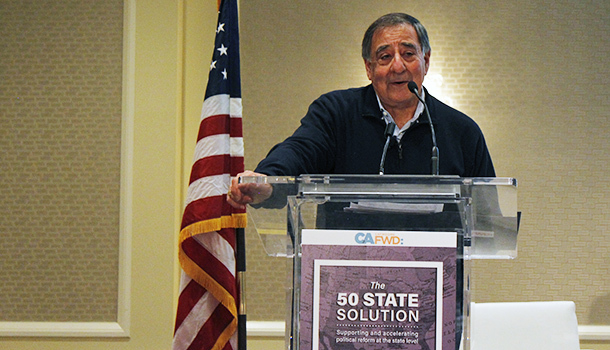 Panetta and many other speakers noted the anger and frustration that has come to dominate national politics—most of directed at dysfunction in Washington (and, over the last week, in the backlash against the new administration’s approach to solving it). But populism and the federal government weren’t the focus of the 50 State Solution: Instead, more than one hundred reformers from across the country discussed how they could organize to expand on a new wave of state-level political reforms that can directly improve the democratic process and help restore citizens’ trust in government, from citizens redistricting and open primaries to automatic voter registration and campaign finance reform. This lack of trust in parties, once they are in power, to adopt changes to the system that put them there was a central theme of the conference. Experts from state and national organizations spent much of the day exploring ways to overcome this challenge in both red and blue states—and sharing ideas for communicating with voters about the problem they are trying to solve. Reformers have long emphasized the need for more transparency and accountability and ethics in American government, but national discontent and the rise of populism have revealed the power of a simpler message: A growing number of Americans on the left and the right clearly believe the political system is rigged—and they want to see something done about it. While the new administration swept into office in a wave of promises to address this through federal action, the 50 State Solution focused on constructive ways to work together to improve state electoral and governance systems—and restore trust in local democratic process. "There were people here from across the country who every morning wake up and think about how to better engage the public and get them involved the democratic process—and what reforms are needed at the local and state and national level to do that," said Ashley Swearengin, the former mayor of Fresno who co-chaired the event along with Secretary Panetta. "It was really inspiring, and it was a great way to launch [this effort]." Many reformers take comfort in the success of major political reforms in large states like California, in particular, where partisan gridlock a decade ago inspired a wave of reforms that established a citizens commission to draw the boundaries of elected officials’ districts, a new primary system that allows more independent voters to participate, an automatic voter registration system, and a series of other changes that have made the legislative process more transparent. Dozens of other states are moving in the same direction—with thirteen other states recently establishing citizens redistricting commissions, for example, and 28 states adopting automatic voter registration. In 2016, Maine became the first state in the country to adopt the practice of ranked-choice voting in primary and general elections, while Colorado is experimenting with a new ethics oversight system. That’s not to say the political reform movement has avoided its bumps along the road: Leaders from both parties in the state of Washington recently torpedoed a series of campaign finance reforms pushed by good government groups, and Republicans in South Dakota are actively working to undermine a set of ethics reforms approved by voters in 2016. This was perhaps the most important question addressed by the group—with experts offering ideas for how to organize the disparate network of state-level political reformers around a change agenda. Chris Gates outlined a set of principles for this “50 state solution,” emphasizing the need for the effort to remain bipartisan (with both Republicans and Democrats involved), nonpartisan (avoiding reforms that would advantage one side over the other), trans-partisan (seeking ideas from across the political spectrum), and state-focused. Gates previewed an early-stage web platform the group can use to stay connected, which will be built out with more information about state reform efforts and their effectiveness. At the end of the conference, the New American Foundation offered to take a leadership role in this effort, with CA Fwd and its partners offering additional support.